My friend Alice was five years older than me, and the right side of her face was roasted in a fire. Three days after she was born, her parents had left her alone in the house to buy meat at the Albert Kuyp market in Amsterdam. The reason they had left her alone in the house was because Alice’s father had bought meat that morning, but when he came home his wife said he had bought the wrong meat. Alice’s mother was still recovering from delivering the baby, and shaky on her legs, but her husband – who was annoyed he had bought the wrong meat – insisted she come with him to the market to buy the right meat. Alice was asleep in her bedstead, and her parents decided not to disturb the baby’s sleep. In the days Alice was born, people used cotton diapers for babies, and dirty diapers were boiled in a big pan on a stove, to cook them clean. When the parents of Alice came back form the market, they saw a mountain of black smoke rise above the bridge, and a little later they saw their house had changed into an inferno. Firemen were trying to extinguish the combustion. Neighbors who were watching the spectacle, had told the fireman the house was empty, because they had noticed the couple had left to do some shopping. None of them knew Alice was recently born. Alice lay in her bedstead on the left side of her body. When I was a child we lived in a subterranean vault in Amsterdam. On the first floor of our house my father had his studio where he shot his advertisement pictures, and I had to model for him almost every day. The walls of our elongated living room were always clammy, and mysterious green, yellow and black moulds drew pattern of undiscovered faces on the bricks. The windows of the vault were placed so high in the walls that I could only watched through them if I stood on the other side of the room. One day a girl appeared behind one of our windows, a child with a roasted face. Later my mother told me she had never seen anything like it. One side of the face of the child was black and purple and maimed. The girl had recently moved into our neighborhood. Alice and I played almost every day. I was the only friend she had. Alice had a few dolls and she had roasted half of all their faces and to me that was just something Alice liked in dolls. My mother allowed me to stay nights over at Alice’s place, and we slept together in her bed, while she told me fairy tales about girls with roasted faces that married princes with roasted faces. Alice made me believe that a roasted face was a beautiful thing. I never knew why she talked so much about roasted faces, I had no idea what a roasted face looked like in reality. Many years later my mother told me that the marriage of Alice’s parents never had healed after the fire. They thought each other guilty for the fire. The mother accused her husband of buying the wrong meat, and the father accused the mother for leaving the diapers on the stove. My mother told me Alice’s father had become insane after the flames. Alice and I played some more on the attic, but the atmosphere was loaded with danger. I didn’t even dare to cry anymore about the bleeding scratch of the saw. Alice’s father was walking up and down, watching us, tapping his lips with nervous fingers. “Why doesn’t your father asks Alice to pose for one of his advertisement pictures?” Alice’s father asked me. “If you ask him he will...?” Her father repeated. Alice and I didn’t say a word for some time. We just sat at the wooden floor of the attic, and our hands were playing a game with some roasted dolls, but our heads were waiting for something. Alice’s father opened the attic window, saying, "it is hot as a fire in here." I remember Alice and I looked each other in the eyes, but we didn’t move. We were just waiting. Alice’s father said we had to come to his attic room and we did. The next moment he said Alice had to climb through the attic window, and that she had to place her feet in the gutter of the flat. I remember that day as if it has been a dream. Alice just climbed through the window and a minute later she stood in the gutter. Her father lifted me in the air, ordered me to put my feet in the gutter as well, and closed the window behind us. The sun was sweltering on the burning tin roof and on our back. Above us the sky rose like an endless deep space to fall into. Below us the gardens were small green patterns. The world didn’t exist anymore. We had nothing to hold onto, just our feet standing in the gutter, and below us was the ravine of the city. We didn’t cry, we didn’t seek for solutions, we just waited until one of us would drop dead. I remember an orchestra of thousand birds that seemed to shriek at us. I looked aside to Alice’s face, and for the first time I saw the scars, the twisted meat, her right eye that was melted into a narrow line, her mouth that couldn’t open or smile the way mine could. Now I noticed she had only one ear, and that she had only one eyebrow. In my mind’s eye I can see Alice's face the way I saw it that day, and she was my lifeline, and I never loved her more. I was 4 years old when Alice and I stood in a gutter above Amsterdam. 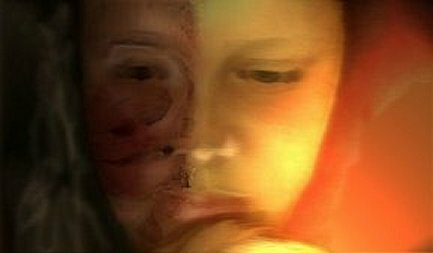 I was 4 years old when I realized Alice’s face was burned and mutilated by flames. A few hours later my mother walked outside our cellar to hang laundry on the line in our garden, and she noticed us standing in the gutter of the flat. A little later fireman came to save us and the father of Alice was arrested by the police. Alice and I lost contact after this incident. Many years later I went to a swimming pool when I noticed a woman with her hair covering one side of her face. The uncovered side of her face was so beautiful I couldn’t stop looking at her. Slowly I began to recognize Alice. I walked over to her and told her my name. We both cried meeting each other after so many years. Alice had had more than a hundred surgery operations on the right side of her face and her face looked different but still destroyed by the flames. We still are friends. One day Alice gave me a beach house as a gift. The beach house burned down last winter. If these are true stories, your life is a novel, my dear Daphne. I just thrill to the quirky and sublime turns you take. Your art work is also thrilling. What a talent you are! Thank you very much for your friendly words. Positively stunning, Daphne. Your writing is so lyrical, it's almost hypnotic (and I mean that in a good way). This is a novel, Daphne. My God. Thanks to all, for reading, and for leaving messages on my Blog. Thank you so much.